When should I clean the vent of my Electric Front-Load Dryer, 7.5 cu.ft (DV50K7500EV)? The dryer features a vent sensor that detects and notifies you when it is time to clean the ductwork. The indicator lets you know the status of the duct. What to do if the indicator is on or blinking? The dryer may keep running even if the duct is clogged, but the drying time will be extended. • The ductwork is not clogged. • No action is required. • The duct or lint filter is clogged. • The pressure applied to the duct is high because the duct is too long or bent. • Check the lint filter or duct and clean if necessary. • Check the duct connections and shorten or straighten the duct if necessary. • The duct or lint filter is severely clogged. • The pressure applied to the duct is very high because the duct is too long or bent. • Check and clean the lint filter or duct and make sure they are not clogged. • Check the duct connections and shorten or straighten the duct work. Remark: When the indicator blinks, it will keep blinking for 3 hours after the completion of the current cycle. If you press POWER or open the door, the dryer powers off immediately. Note #1: If the indicator turns on for the first time and is solid (not blinking), check and clean the lint filter and/or duct. 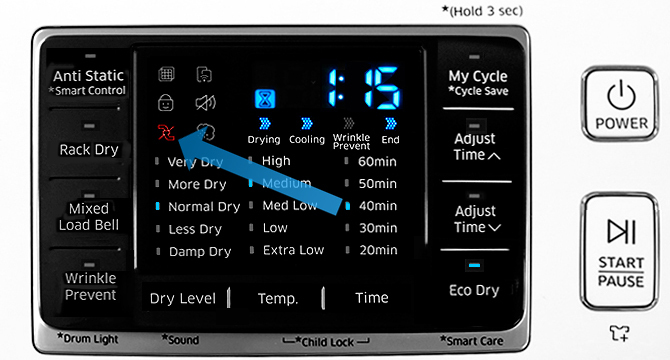 Note #2: If the indicator turns on again later, it is because the duct is installed or connected with some restrictions (it’s too long or has too many bends). This is not a system failure. However, drying time may be extended or the drying performance may be degraded.